For Windows XP, Vista and now updated for Windows 7. Untested on Windows 8 (See below). This stunning windowblind brings you right to the bottom of the sea floor. Join the StingRay as they inhabit your desktop with a crisp visual style. Thanks for diving with me! 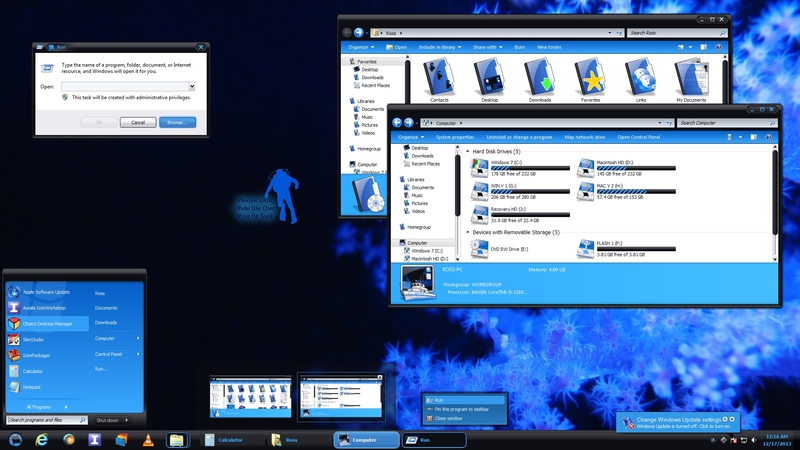 Windows 8: Since it's still new, I'll only be doing Windows 7 skins from now on. That's all I own now. to me, still seem unsafe. Won't debate the issue. JMO. If it works, Great! If not, Sorry. first comment great skin excellent ive not bought it but it seems awesome ! I do believe that is why only masters should sell their skins when awesome peces of work are done! what is that on the main preview on the control panel? the minimize maximize and close button there are 2? I can't buy because i don't have credit card. Anyways your work is awesome. this is a great skin and it converts for use on vista very well. to be honest, i don't care for the diver glyph on the start menu but i can live with it. nice job, z71! Comment #1 deepbladeToday, 10:55 AMfirst comment great skin excellent ive not bought it but it seems awesome ! umm the two min max and close buttons are to show you the mouse-overs... and the other one looks like a mis-cropped jpg..
anyhoo, nice work.. ill be geting it. Good luck on this one..... not really my style, plus it has a higher than normal price even for a master skin... So I'll pass. Thanks everyone for the very nice comments. deepblade, akedo1 explained it perfectly. Snidely Whiplash, just change the "StartPanelPlacesListGlyph.tga" to something else, and it will remove the glyph from the start panel. Nice and clean. Lotherius, thanks for the nice words. Been waiting for someone to bring up the price. Windowblinds, iconpack, logonxp and wallpapers....$8.95. CursorXP and a sysmetrix skin for $1.00. To me, it doesn't seem unreasonable. This will be the only time I comment on the price. This looks really really tempting Z71, is there a compact Start-Panel for XP? Hint to Stardock: Need WB for Vista-64bit!! deepblade, any of my website issues should have been emailed to me. The sysmetrix date is when I took the SS of it. Thanks for pointing out the (small) typo in the description. Please make all comments about the (skin) itself. aufisch, a compact startmenu is not included. Will be on future skins. Thanks. We give it 5 stars! I've learned my lesson on updating typos. I fixed the text in the description and it went back into moderation. Stardock is closed until tuesday, for the Holidays, so the skin might not be available for the next 4 or 5 days. Once again, I've learned my lesson. This IS a great skin, but I've stopped buying them. To easy to lose, unless you back it up, and most of the time I forget. I've bought like 3 or 4 and have no idea where they are. Cool skin though. Just need to open Stardock Central and click on "Registration info" bottom right corner. Then click on "Lookup Serial Number". Your serial numbers of products purchased along with download links for purchased skins will be sent to the email address used during purchase.